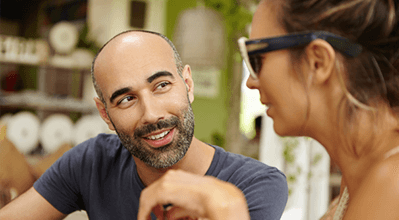 Presbyopia is a very common visual condition that normally happens in a person’s 40s or 50s. A young, healthy lens has an elastic quality to it that allows it to “flex” forward as needed to focus on nearby objects. As we age, the lens hardens and starts to lose its flexibility. This is why so many middle-aged adults start to rely on reading glasses or readers to focus on nearby objects. The Kamra inlay was developed and FDA-approved for people with presbyopia that don’t want to wear reading glasses. Dr. Ernest Kornmehl was one of the early adopters of the Kamra inlay and offers it to his patients that struggle with presbyopia. The Kamra inlay is a tiny disc-shaped implant with a hole in the center. It is placed over the cornea in one eye and creates a pinhole affect to control the amount of light that is let into the eye and focused on the retina. According to Dr. Kornmehl, the larger the opening or aperture, the blurrier the vision. By reducing this opening and controlling the amount of light that enters the eye, the Kamra noticeably improves near vision. Kamra patients either reduce or eliminate their dependence on reading glasses. 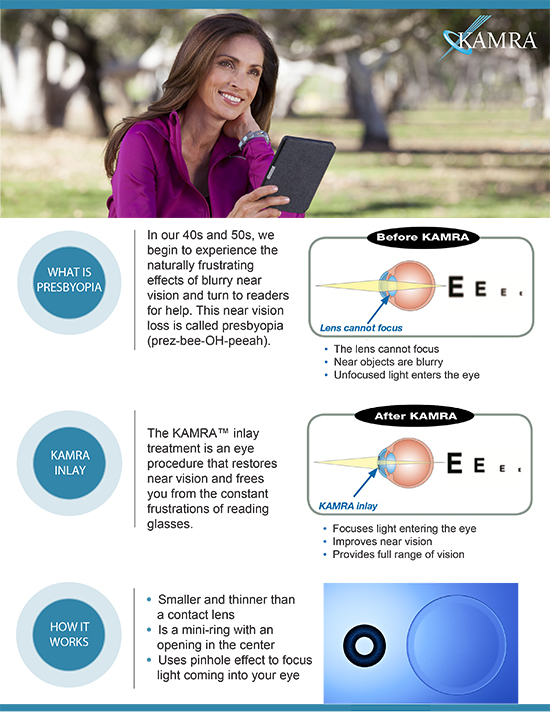 Better near vision with the Kamra can substantially improve a person’s quality of life. It makes it possible to read a book, newspaper or menu without having to first reach for reading glasses. 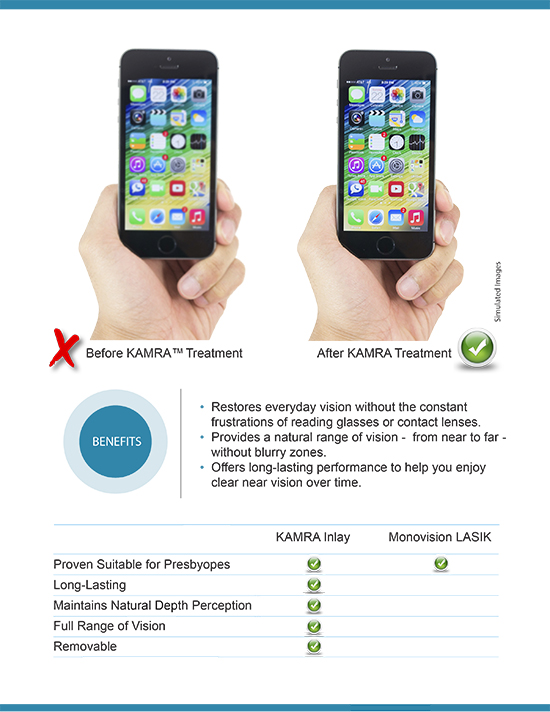 The Kamra also offers long-lasting performance, so patients can enjoy clear near vision for many years. The Kamra Inlay is very small – about a quarter the size of a soft contact lens and about the thickness of a human hair. During the placement procedure, the Kamra inlay is positioned so that its opening is directly in front of the eye’s pupil. It is placed in the deeper layers of the corneal tissue of the non-dominant eye. Placement is performed in Dr. Kornmehl’s office, and the recovery is usually takes a few days to several weeks. Is the Kamra Right for Everyone? Although the Kamra inlay is an ideal solution for many, it is not right for everyone. Kamra inlay patients should want to restore clear near vision and reduce dependence on reading glasses. Dr. Kornmehl recommends Kamra for adults over the age of 45 that have good uncorrected distance vision however, are noticing the effects of presbyopia, should be in good health and not have any eye disease or disorder. A comprehensive evaluation is required before recommending a candidate for the Kamra inlay. To schedule a consultation with Dr. Kornmehl and discuss the Kamra inlay in more detail, please call or email Kornmehl Laser Eye Associates today.